If you’ve got the type of hair that spends most of its time looking at you forlornly as you try to tease it into curls, then you need to read this! Curling your hair can actually be achieved with the right styling tool and some guidance from the experts. You may have tried curing wands, curling irons and even straightening irons to get a wave in your hair, with limited success but that’s possibly because you’ve bought the wrong hair tool. Specifically, you need a curling wand designed for fine hair, something that can cope with your hair’s texture without burning it or damaging it. What are the Main Considerations When Curling Thin Hair? Are Curling Wands Good For Short Hair? What Size Should I Use for My Hair? When to Use a Curling Wand vs Curling Iron? Always remember that since your hair is fine, it cannot cope with high heat for a prolonged period of time. If you do use a high heat, you run the danger of stripping your hair of moisture and leave it looking dry and brittle. It won’t shine and neither will it have good movement. You also need to remember that drying out your hair can lead to damage. This is a problem that is usually associated with fine hair. Plus, you should think about the type of products you use on your hair. Before applying a curling wand, always use a quality heat protecting spray which acts as a barrier between the tool and each strand. This helps to stop the high temperature from burning your hair. Try not to over-apply styling products because the heaviness of creams, mousse or serums can affect how your hair responds to styling, too much product can even lead to hair looking lank or greasy. So, go easy on styling products. When you wash and condition your hair, always make sure you really rinse out the product so there’s no excess shampoo or conditioner left in your hair before styling. This helps to keep your hair light and airy and ready for styling. If you’ve got short hair, don’t worry, you can still use a curling wand. The main thing to consider is the size of your curling wand! If you buy something too long, it will feel awkward to use on your hair length and a wand with a very thick barrel won’t cope with short hair. You need a slim-line barrel of around 0.5” to 1” and aim for a shorter length barrel if you can. Remember, for very short hair you won’t achieve big curls but you could achieve pretty waves and if your hair is long enough, cute bubble curls. People do get confused over whether to use a curling wand or a curling iron. Don’t they do the same thing? Well, generally yes, they can usually create the same or certainly similar result but, if you have fine hair, opt for a curling wand rather than the iron because then you instantly eliminate the clamp action. A curling iron is similar to a wand except it has the added mechanism of a clamp that holds the hair into place, therefore applying more heat and pressure on the hair so increasing the chances of damaging it. A curling wand doesn’t hold the hair quite as close to the barrel (although it will always touch the barrel) so it’s slightly less damaging. Temperature settings. 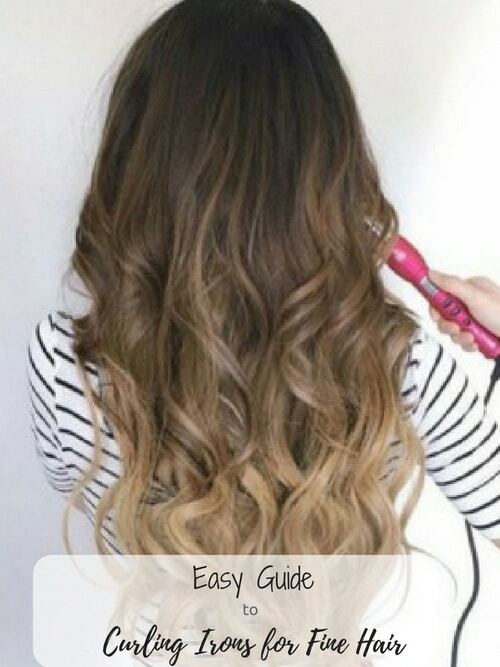 You need a curling wand with a number of different settings so that you don’t over-heat hair. It’s best to choose something with variable temperature so you can actually select the right level of heat for your hair type. Choose something that has auto-shut off so you don’t run the risk of over-heating your curling wand. Always buy something that comes with a protective glove, this will stop you burning your fingertips! Choose a curling wand that has a cool-tip, again, this will protect your scalp from burning and your fingertips too. A temperature indicator light is a useful feature so you know when your curling wand is at the right temperature setting. You might want a curling wand that has a memory feature so it memorises your preferred temperature setting. Look for something with tourmaline or ceramic technology as both are good heat conductors, banishing frizz and flyaway hair. Start with dry hair. Never use a curling wand on damp or wet hair as you will burn your hair. Apply a heat protecting spray. Section out hair (not necessary if your hair is very short). Switch your wand on and wait for it to reach your desired temperature setting. Put on your heat protecting glove. Starting at the back of your head (working forwards), wrap a lock of hair around the barrel. Keep the hair wrapping tight if you want tight curls, loose if you want loose curls. 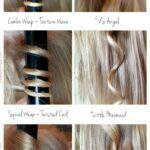 Hold the hair against the wand for a few seconds, then release. Continue curling around your entire head. Shake out your hair at the end and apply a little serum to smooth away and flyaway hair and to add glossiness. Now that you understand the important considerations, we have included a detailed list highlighting our favorite curing wands for fine hair. The Bestope Curling Wand which comes with five interchangeable attachments including three different sizes and a spiral barrel too giving you lots of different options. There’s a locking feature on the handle so the wand won’t slip out of place. The wand is made out of ceramic and PTC pottery and heats up in just 60 seconds. It is also entirely travel friendly as it boasts dual voltage and comes with its own heat-resistant glove to protect your fingers. The Bestope also comes with a 12 month warranty and a 60 day money back guarantee (for added peace of mind). Consider treating yourself to this slim line wand from Remington which comes in 1 or 1.5” size. It’s ideal for short or very short hair and has a variety of useful features such as a temperature selection up to 410 degrees Fahrenheit, a quick, thirty second heat-up, one hour auto-shut off and easy-to-read digital display. This curling wand comes complete with a heat-resistant glove too and it’s made out of ceramic so it’s an excellent heat-conductor. The barrel tapers so you can create different size curls and the temperature lock feature means you can set your preferred temperature for future styling sessions. At just ½” wide at its smallest point, this is one of the smallest curling wands you can buy and is a very good choice. This little baby promises the cutest curls and comes loaded with excellent features such as a conical barrel that tapers down to ½” (1” at base). Tourmaline with ceramic technology makes this an excellent heat conductor so it won’t damage your hair (with careful use). 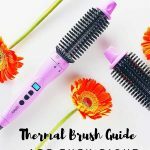 It also has five temperature settings, a quick heat-up (just thirty seconds) and auto-shut off, so there’s no chance of your hair tool over-heating. If your looking for a budget friendly option, consider the Curlipops. The slim-line 1” Bedhead Curlipops Curling Wand offers ceramic and tourmaline construction which delivers shine and hydration. The heat settings stretch right up to 400 degrees F (this temperature setting is not recommended for fine hair). Additionally, the Bedhead includes a long, tangle free cord for freedom of styling and a protective glove to keep your fingertips from burning. It delivers superb curls. The tapered Xtava professional wand offers three different barrels to interchange at varying sizes from 1” to 1.5” which makes it suitable for short hair and mid-length or even longer hair. Made out of ceramic with tourmaline, it’s a great heat conductor and keeps hair frizz-free. This option offers 22 temperature settings ranging from 200 degrees F to 410 degrees F meaning you can choose the right heat for your hair type. You can also lock-in your desired temperature so you don’t have to fiddle around finding it. Additionally, the LCD display helps you to keep a close eye on the setting. There’s also a swivel cord and 60 minute shut-off so there’s no chance of your curling wand over-heating. Finally, the two year warranty gives you added peace of mind when making the purchase.